All of our watches are in stock, come with a 2-year warranty, and are available with steel or leather straps. Use the filters to refine your search. Watches are convenient timepieces that fit snuggly on your wrist, as compared to pocket watches that reside in a vest pocket. However, there are many different types of inexpensive watches, something we have written a lot about in the watches main category. Here we will cover the various straps that are available. 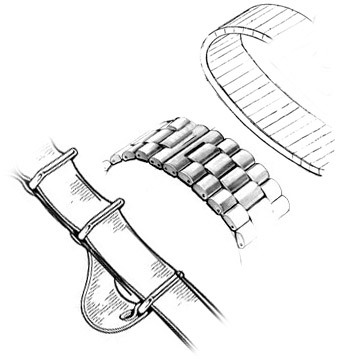 There are mainly three different strap types that you can use on your wrist watch, as shown in the illustrations below. 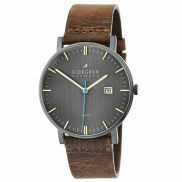 The first is a mesh strap, often seen in Skagen watches. The biggest advantages are that the strap is very durable and the lock offers great flexibility in positioning. 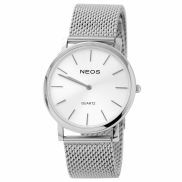 The next is a standard steel strap which is also very durable but far less adjustable having only one locking position. You can visit your local jeweller who can easily shorten the strap that will give you a real custom fit. The bottom strap is a leather strap which already has several locking positions. Be aware that leather watch straps can vary greatly in quality and the faux leathers really donât wear well. Trendhim carries only 100% genuine leather watch straps that last for a long time and keep their sheen and colour.